As the country heads towards a date with destiny and the celebration of the 800th anniversary of the signing of Magna Carta in 1215, it's inevitable that the movers and shakers of that age will see their history step into the spotlight, and perhaps none more so than the great William Marshal. Largely unknown outside the circles of medievalists and re-eanactors until recently, he is now beginning to enter the mainstream consciousness as evinced by a couple of recent BBC2 documentaries about his extraordinary life and some new biographies to add to the three already out there - We have to wait until December for Thomas Asbridge's offering, but this one by Richard Brooks is available now. 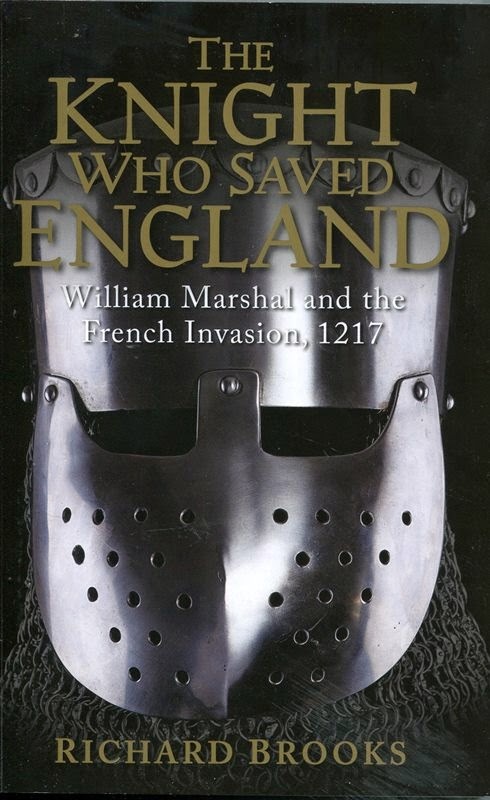 Despite the title's sub-text that it's about 'William Marshal and the French invasion of 1217', the book is actually a fairly thorough biography of William's life. It does concentrate on the pivotal campaign of 1217 for approximately the last third of the book, but that leaves plenty of room to write a substantial biography to bring William to that point. The author has plenty of scope to explore the making of the man who was destined to lead the battle against the French invaders and begin the process of reuniting the country and setting it back on its feet after years of devastating unrest during the reign of King John. Had the Battle of Lincoln been won by the French in 1217, the country would have had a very different story today. William Marshal's victory was one of those destiny moments, something that Brooks squarely acknowledges and keeps at the forefront of his narrative. Not including a glossary, bibliography and index, the book is 300 pages long and details William's story in succinct but never skimpy detail from cradle to grave. There are some excellent and unusual colour plates mid book, which add value and interest to the narrative and are a cut above the usual suspects. There are some very useful tables with content such as lengths of marches undertaken, the number of campaigns William fought in, his known tournament record. The straight narrative details of William's life are interspersed with fascinating facts. I did not know for example that soap was used as a weapon in medieval warfare - to make the decks of enemy vessels slippery, or that a live bear was presented as a prize at at tourney in 1215. Personally I love whimsies like this and it added enormously to my enjoyment of the work and kept me turning the pages. I have read all of the Marshal biographies out there,including the 13th century Histoire de Guillaume le Mareschal, and have studied the man in depth myself for 10 years, albeit to recreate him in novel form. This work is a very fine addition to the oeuvre. Richard Brooks understands the Marshal and brings out facets largely ignored by his other biographers. Brooks' Marshal is a talented military commander, shrewd, and well able to grasp the complexities of a situation from all angles. He's a statesman too. It's not war for war's sake but he will not shirk from fighting if he must and he understands tactics very well, including subterfuge. Reading Richard Brooks' fine, lucid and erudite prose, one is given a view of the Marshal in full, sharp clarity. Personally I feel that this biography of the Marshal comes the closest of all of them to understanding the man. There is not a great deal about his family life, but that is perhaps a facet for another biographer to tackle. The main thrust of this book is his military and diplomatic career and it is written with vivid, insight. It is not without its moments of questionable history, however, and outright gaffs and it is a case of being wary and not taking everything as gospel. I was irritated by Brooks' constant referral to William's father as a 'weathercock' and 'disreputable baronial backwoodsman'. Indeed, I underlined the latter and wrote NO! in capital letters beside it. . John the Marshal changed sides just once in the war between Stephen and Matilda and in the early stages - rather like Matildine stalwart Brian FitzCount and all the others who swore to Stephen at the outset of the reign. That's not being a weathercock. He put his life on the line for the Empress at Wherwell and lost an eye, and then again at Newbury where he sacrificed his son in order to buy time for Wallingford. The lord of Wallingford, Brian FitzCount had vanished to become a monk, leaving John Marshal to stand alone. And as to being a backwoodsman - he was the King's Marshal. He controlled the Kennet Valley. Professor Crouch says of him 'He was no coarse bandit. He was more of a baron than a robber...He played the great game of politics with talent and perception...a preudhomme or 'man of standing' in his son's eyes.' With his marriage to Sybilla of Salisbury, he became brother in law to a French prince, the man next in line to the French throne. There's also the perplexing remark that William spoke English at home and didn't learn French until he went to train as a squire. That's blatantly wrong. The nobility spoke a version of French - Anglo Norman and it was William's first language. How on earth would he have managed in Stephen's camp among all those French speaking nobles if it wasn't his native tongue too? He possibly had a smattering of English but his first language was French. So that's one detail to take with a huge pinch of salt. Brooks says that William was called William to curry favour with his more illustrious relatives on his mother's side. He doesn't seem to have noticed that John Marshal had a brother called William, the vicar of Cheddar in Somerset who was actually Empress Matilda's chancellor, so it was a family name on both sides. Again, it indicates that the research might have been more thorough in this area. He also seems to think that William's father thought it a waste of time for William to learn to read and write, but that seems a strange conclusion to arrive at when William's father himself is indicated to be a literate man and would have known very well the value of literacy. 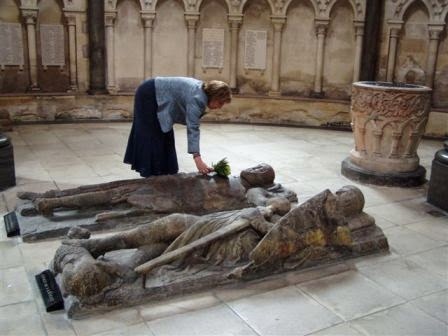 I would also say that William is not dreaming at peace in the Temple Church, although it's a nice fancy. He and his Templar colleagues are there armed and ready for battle. They are alert and on guard, waiting to fight at the Last Judgement because they are lying in a satellite of Jerusalem on earth where that battle will begin. If colour and paint remained, their eyes would be wide open. A final item I cannot let pass even if it is a nitpick (there are others but I've let them be) is the comment that William addresses the young future Louis VIII 'amorously' by calling him a 'demoiselle.' However, a 'demoiselle' in Anglo Norman is just a young person - in the male case an untried bachelor knight. So William isn't addressing him amorously. He's an old, wise man, calling the other one a young whippersnapper - a different nuance entirely! Despite the above caveats and nit-picks THE KNIGHT WHO SAVED ENGLAND is going straight onto my keeper shelf and will be referred to and re-read. When Richard Brooks is on solid ground and covering the military aspects, this work shines a light into areas no other Marshal biographer has illuminated in the same way. The insights hold the ring of truth and Richard Brooks obviously understands his man very well indeed - and I would venture to say better than any of the Marshal's other biographers have done. He recognises the Marshal as a competent, gifted soldier and statesman through to the core against whom other national heroes 'appear hollow in comparison.' Exactly. This is highly recommended reading for anyone interested in history and a must for the legions of William Marshal fans out there. Disclaimer. Osprey books were kind enough to send me a review copy. I don't usually review ARCS but I wasn't going to say no to this one - and I'm glad I did read it! Fantastic review! I like that you applauded all that was right with the book but aren't shy about bringing up the nitpicks in what is wrong. With such a brilliant endorsement from yourself I will definitely be purchasing this book. I have an egalley of this one - looking forward to reading it even more now that you thought it was a keeper! I have this on my wish list and was debating if I wanted to buy it - after this review it will remain on my wish list. Does the record of the tournaments mentions all the meetings, dates, etc.? I owe you an e-mail but life is flying by at its usual berserk speed. The tournaments are separated out in a table into the year, the location and William's exploits. As usual there isn't that much mention of the Young King - as I know you've come to expect from long experience, but it's a good addition to the Marshal story in non fiction for me because it does focus new spotlights. Main sources are the Histoire and the Barnwell Chronicle. I just ordered it on my kindle from Amazon. Thanks for the great tip. I am running out of Elizabeth Chadwick books. I just ordered it from Amazon. I am running out of Elizabeth Chadwick books. Thanks for the hint. Enjoyed this terrific well-written review. It was an excellent, and pointed out the strengths and weaknesses, and the positive and negative aspects. Good job! Thank you, Elizabeth! Don't worry about the e-mail :-) I can imagine how very busy you must be. Thank you for the information. Actually, what I have already read about the Young King in the book via Google Books came as a nice surprise. Except for the usual few words about the Great Revolt and the war of 1183 there were some interesting details and the author seems to look at the events from different perspective, devoting more time to describe William's life at the court of the Young King, the aspect of his career that the writers before Mr Brooks didn't discuss at length. I am in awe of the depth of your research. I have just written my first novel, set in 1193, and I am blown away and humbled by your level of detail and how you can so easily bring out this or that connection among the leading families, through the generations, and in relation to the major events. I've read your books, but I've only just now found your blog. Wow. You must feel often as if you are living among them as you write your stories. Thanks for letting me gush a little. WOW. I've bought this and have it on my (huge and tottering) 'to be read' shelves but have only just tread your review which has made me even more keen to read the biography. Love the detail in your review. areas in the back of my mind. I bought it because it was only 99p from the UK Kindle store And because I am a great fan of William Marshal through Elizabeth Chadwick's excellent novels. Really looking forward to reading it.